This article is a part of the Ogunquit in September Guide I am writing, for the model aeronautically-inclined. This installment is about the Tidal Suites at the Norseman Resort we stayed at, during the first part of the trip. As was usually the case, I spent time writing this article after the trip, because I wished someone had written something about this topic, and had posted some pictures of this place online. It would have helped me tremendously during my trip planning. And it would have eased the anxiety I continued to feel until the day of departure. But there was very little information to be found online about the resort, and almost nothing about the new Tidal Suites. Most of pictures showcased here are taken by Elisha Huang. Here is the same picture without cropping. 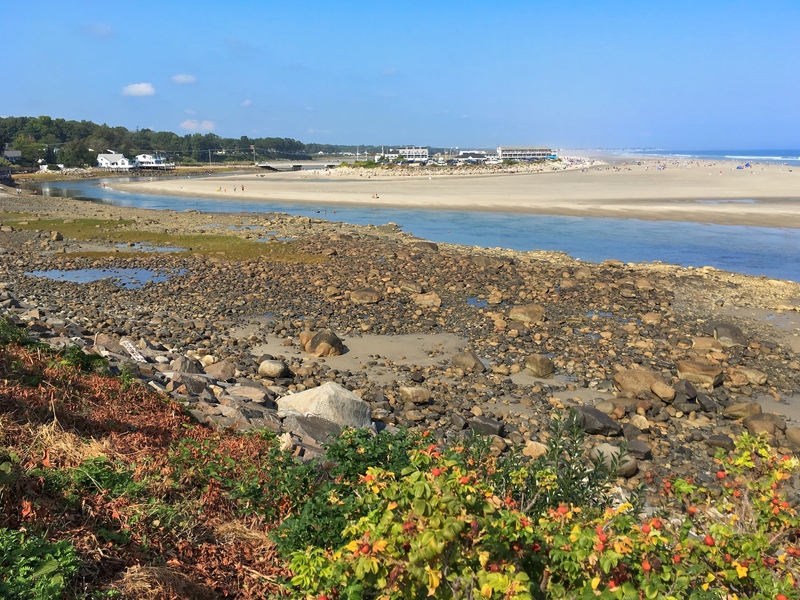 This was shot at low-tide, and one can only see a mere trickle of the the Ogunquit River in between the rocky shore in the foreground, and the expansive Ogunquit Beach in the background. Surrounded by the beach stands the Norseman Resort, comprising several separate buildings. The river empties into the Atlantic Ocean to the right. This is the same beach at high tide. 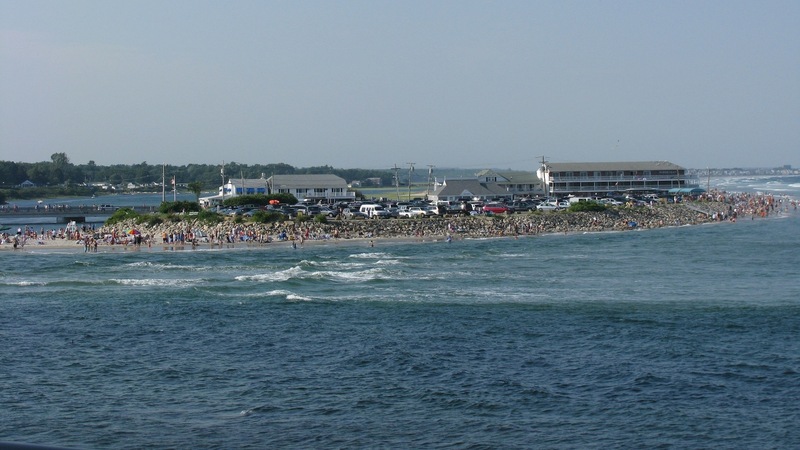 Note how the high tide completely swallows the expansive beach and the rocky shore, forcing merrymakers to congregate into an ever-denser crowd, looking for a place to stand on the ever-disappearing beach. 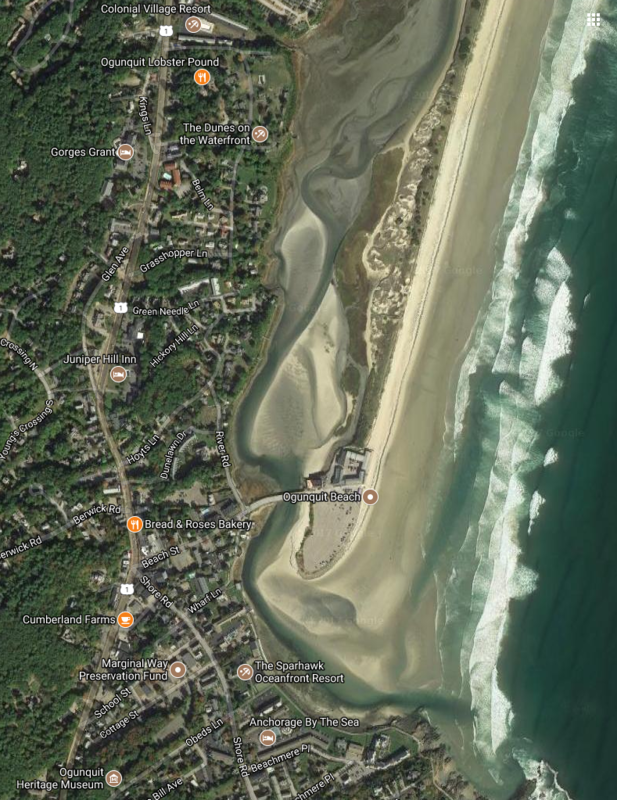 Google Maps gives us some hints as to why the beach works the it way it does. This is a satellite image of the peninsula, with the famous stretch of the beach at the tip of the peninsula. The entire beach spans from south to north for 2.5 miles. 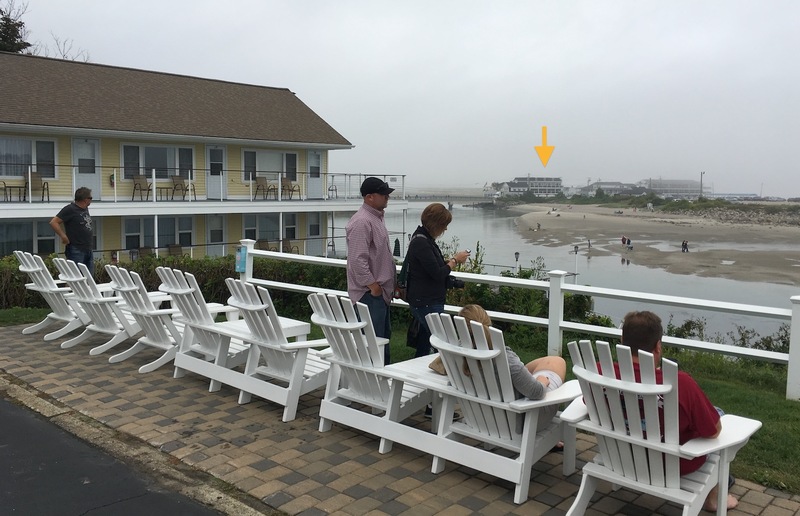 I don’t know if peninsula is the right word here, as the Ogunquit River runs on the left side of the peninsula, and empties into the ocean at the tip of the peninsula. 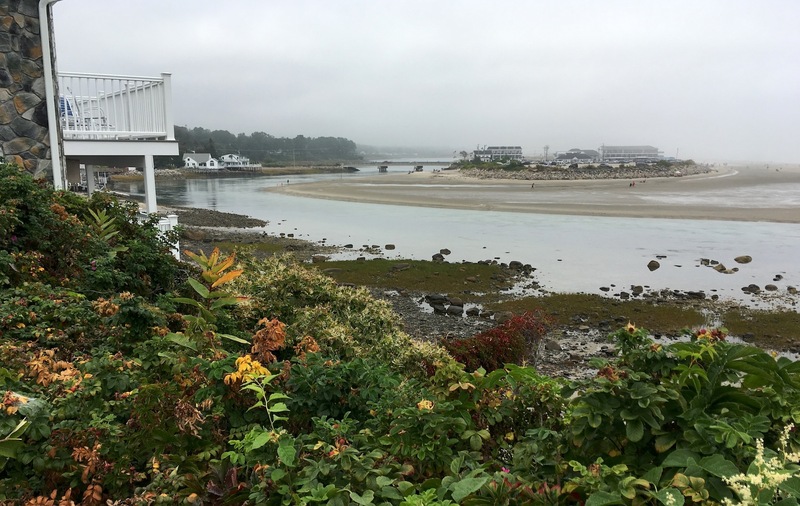 The main beach is actually part of the Ogunquit river delta. 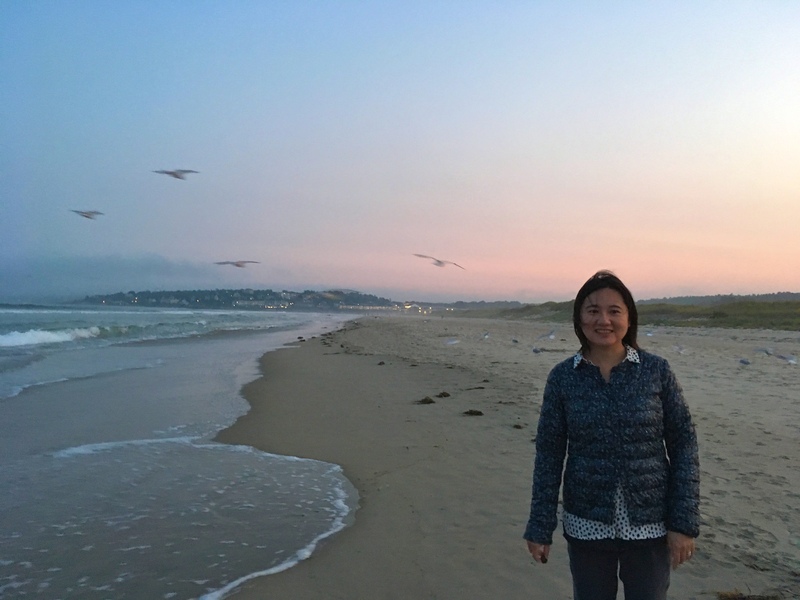 Ever since I stopped by Ogunquit years ago, for an afternoon on our way from New York to Acadia, I had always wanted to come back and stay on that magical beach for a few days. I figured that it would be quite an experience to fly model planes on the beach. So I waited until past Labor Day, when kids reluctantly left this popular place to head back to school. 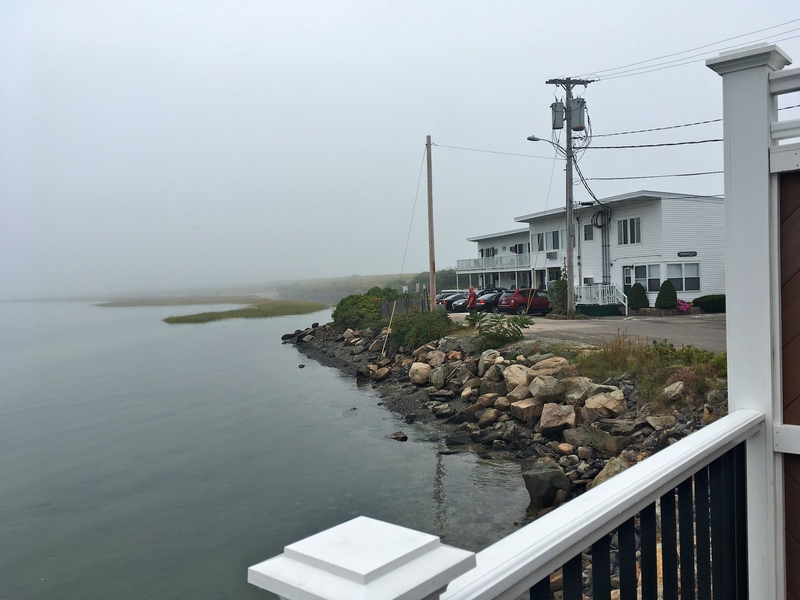 But even then, I still couldn’t find a beach-facing room in the newer buildings of the Norseman, the only beachfront hotel in this entire town. 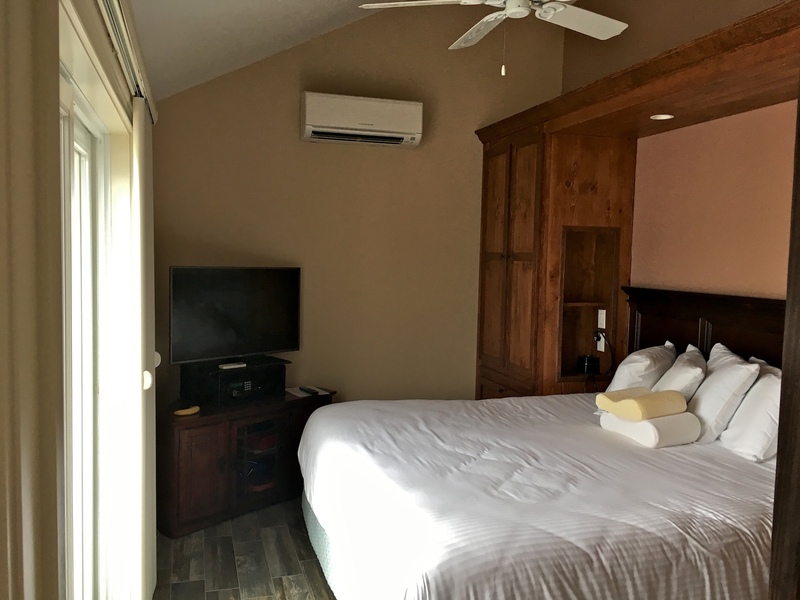 Information about rooms at the Norseman is scarce online. There are some user reviews at TripAdvisor. But most are not very helpful. I found that majority of complaints appeared to be centered on the fact that the rooms were not great, that cleaning service was subpar, and that all beachfront rooms share entire balconies with everyone else on the same floor. The newer buildings appeared to have better amenities. 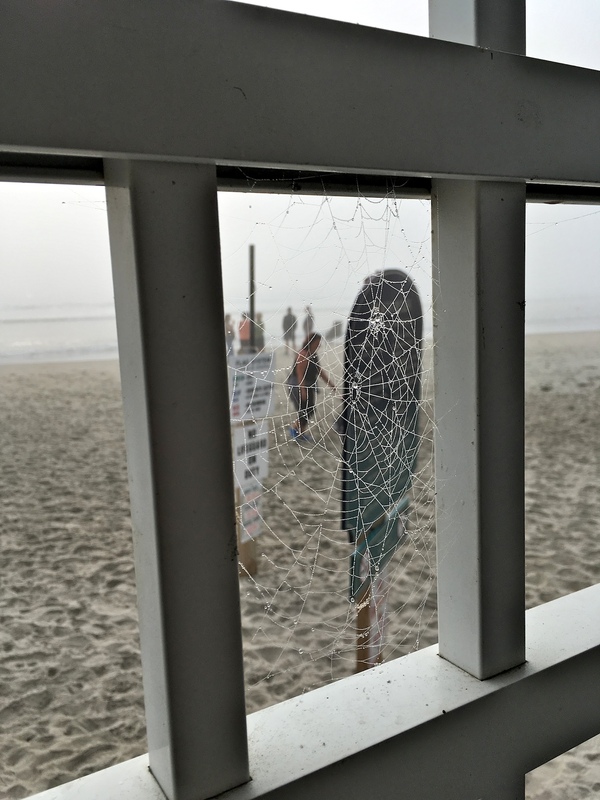 I’ve stayed at beachfront hotels before – sand gets everywhere, and the cleaning staff just can’t get every grain of sand off every corner of the room. To me, that’s to be expected. However, having no privacy when curtains were left open to merrymakers on the balcony was a big turnoff. That said, there are no other choices for a hotel if you want to stay on the peninsula and have a direct water view. Note how the only access to this beach from the town is via that one narrow bridge seen in the previous picture. There is actually another hotel, the Neptune Inn. But it is besieged from all sides by Norseman buildings. Then a handful of people on TripAdvisor talked about the Tidal Suites, a new building that became available in 2015 at the Norseman . It was more expensive, but also more spacious and secluded. Instead of facing the ocean, however, it overlooked the river. As usual, there was not much to be found online about these suites. I was very interested, but had plenty of unanswered questions before I could commit to booking a room there. For instance, how private was the so-called “private” decks? The suites overlooked the river, presumably. Was the view grand? This was a tidal river. Did it smell like rotten eggs at low tide, as would my local town dock? Can I rent a kayak on the premises? Is there room to store a kayak if I rented one elsewhere, or even brought my own? Do I need to bring my own beach chairs and a beach umbrella, or were these part of the room deal? Also, where exactly were these rooms? 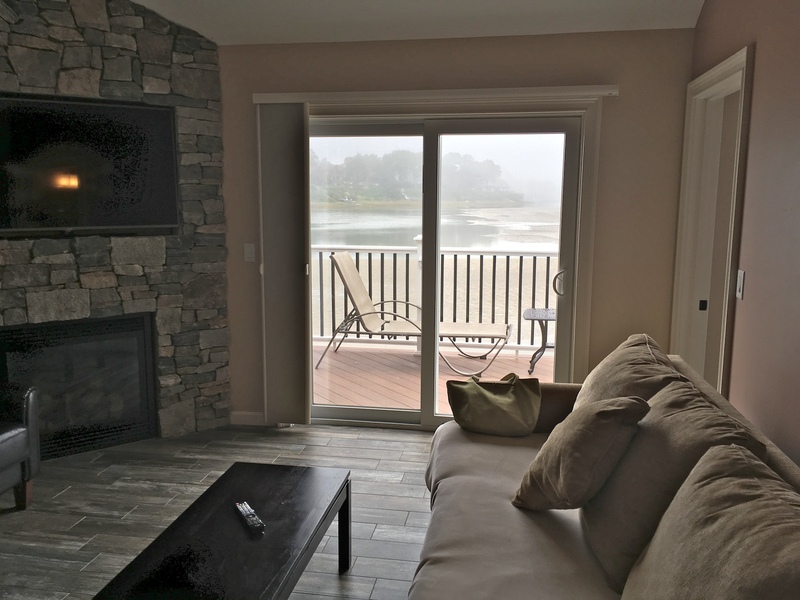 How was the view of the river from the room and from the deck? 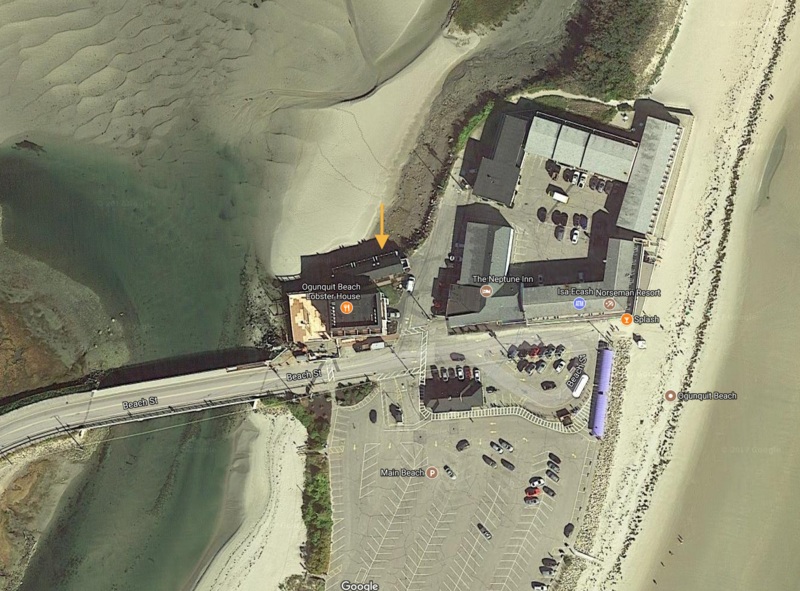 The Tidal Suites are marked on the Google Maps satellite picture with an arrow. The equirectangular panorama below shows a 360° view of the Lobster House and various Norseman buildings. It was shot from the middle of the bridge. 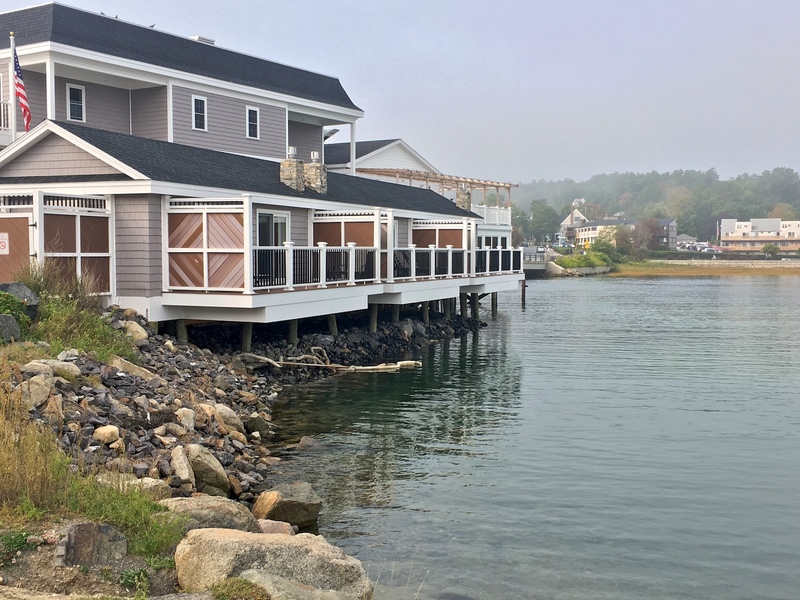 Tidal Suites is behind the Lobster House building that sports an outdoor seating area on the second floor. The 2D view is deceiving. Click on the image to see what the view looks like interactively, on Google Street View. Click here to see a larger version of the equirectangular picture in 2D. The suite looks nondescript from the front. 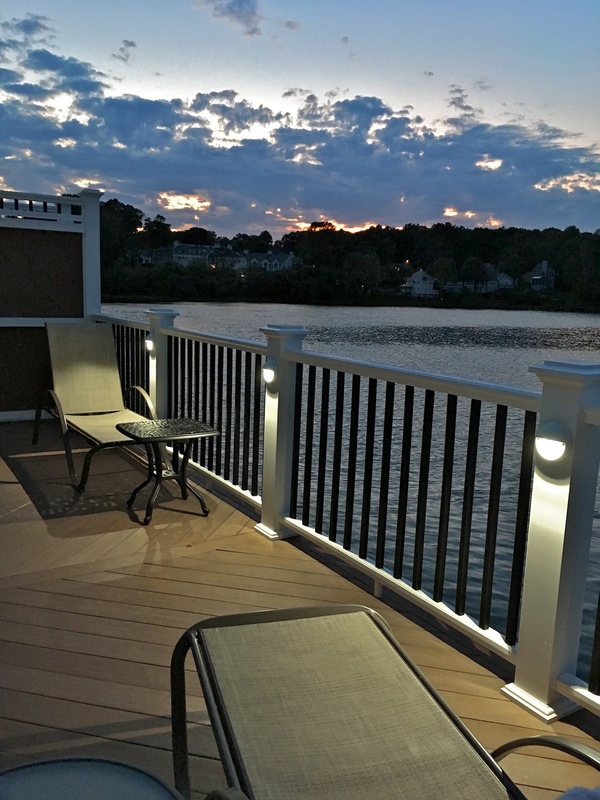 But it has got a nice private deck on the riverfront side. There are three suites in this building. I stayed at the one closest to the camera. Note the building behind the suites with a pergola on the second floor. That’s the Lobster House. 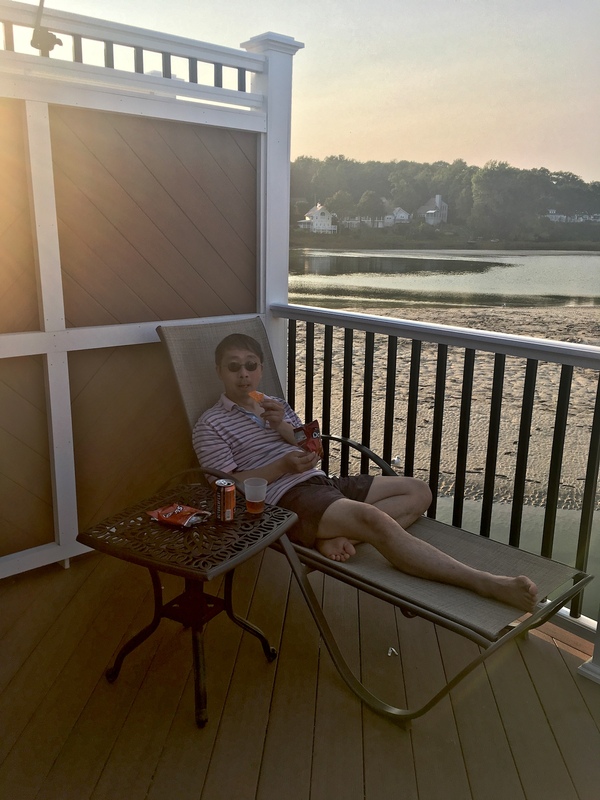 Sometimes from within the suite we heard mere suggestions of music from the Lobster House even with all doors closed. It didn’t bothered us much. Your mileage may vary. We enjoyed a nice afternoon meal sitting at an outdoor table under that pergola. 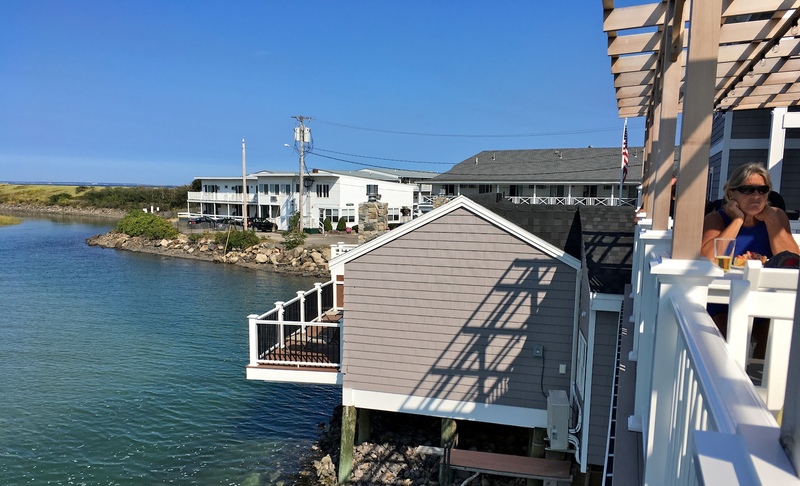 The deck of the last suite of Tidal Suites is visible from the Lobster House. After unloading luggage, I left to fly my planes without first bothering to unpack. If you have never seen a beach wagon like this one, head to modern beach equipment for the model aeronautically-inclined. 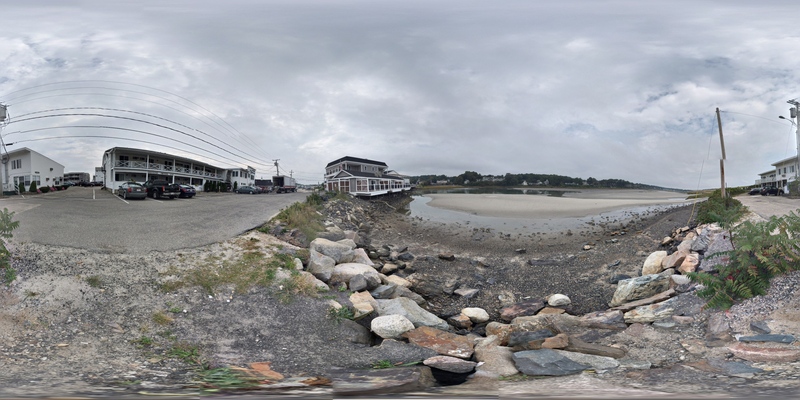 As I towed that beach wagon to the beach, I took a 360° panorama of the suite and its surroundings, from the parking lot. Every suit gets a private parking space in this crowded parcel of land. Parking at the public parking lot sets you back $30. Same as before – click here to see an interactive 360° view, or here for a bigger 2D picture. The living room is spacious. Here luggage has just been unloaded from our car. There are two independently-controlled AC/Heating units. One is in the living room as shown here. I loved it – I know “Mr. Slim” from Mitsubishi well. 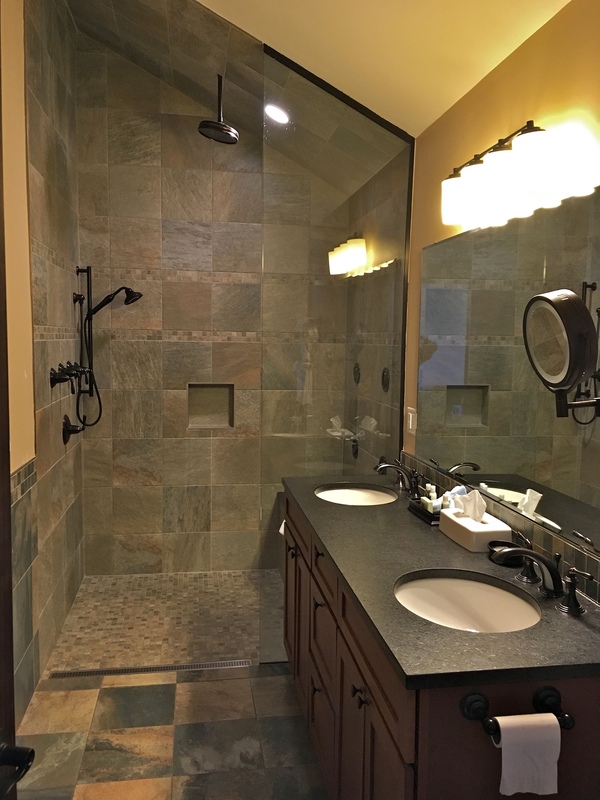 I installed 4 units in my previous house, and loved them to death. Only a new house parted me from my beloved Mr. Slim units. While I didn’t much care about kitchen tools, a certain member of our two-person party felt that there should have been a stove in a suite of this kind. At the least a proper tea kettle should have been available. I am just going to park the comment here, for those who may care about this type of stuff. The view of the river from the living room was gorgeous. 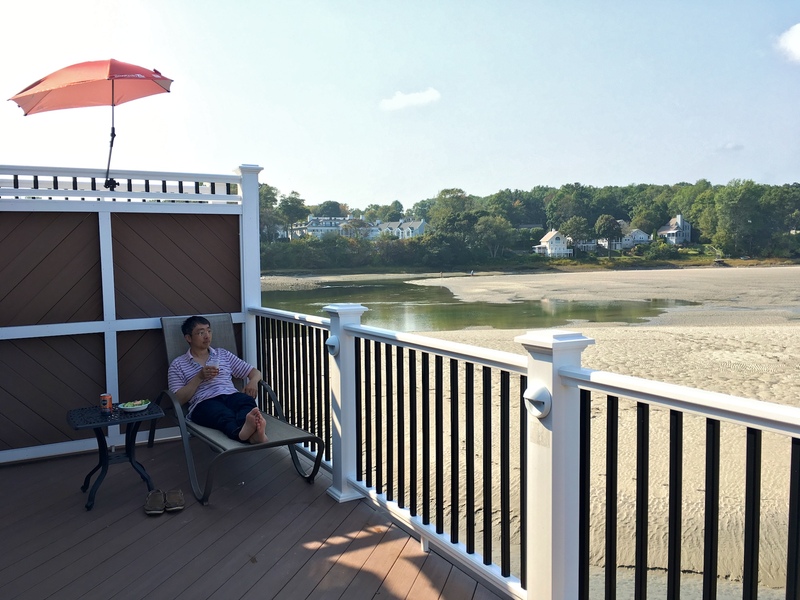 The private deck came with two loungers and two coffee tables. 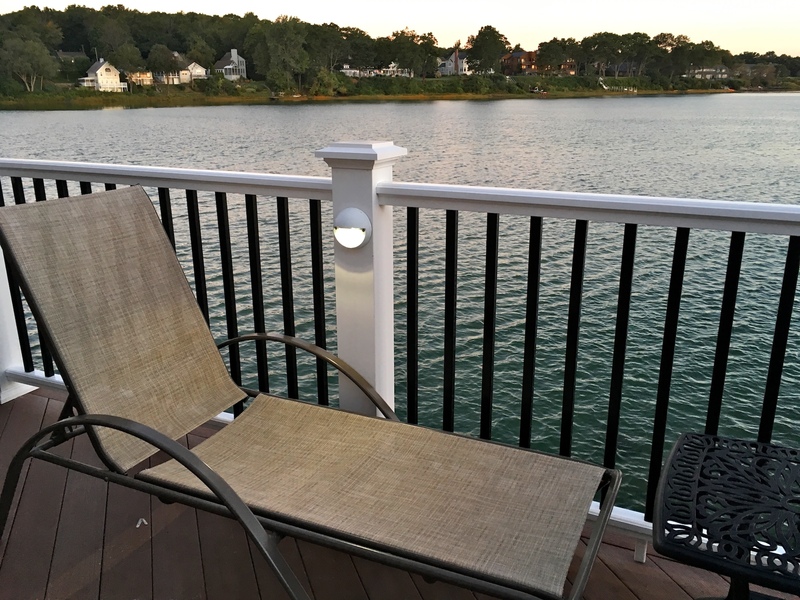 A wall separated my deck for the adjacent deck, so there was good privacy – except for onlookers standing far away on the parking lot. There were no onlookers. Everyone was busy minding their own vacation. The bedroom featured a ceiling fan and another Mr. Slim unit. There were plenty of drawers for clothes and stuff we brought. There was plenty of space to hang jackets. My only issue with the suite was the lack of large spaces to store empty suitcases. Some beach equipment I brought, such as the beach tent, were not small. There was no place to store them out of sight. I ended up pulling the sofa away from the wall, and used the space behind it as storage. The bedroom had its own floor-to-ceiling sliding doors for access to the deck. I was told not to try to drag loungers to the beach. They were too heavy anyway. You could rent beach umbrellas and beach chairs at the beachfront store. But I brought my own modern equipment. A view of the bathroom completes the tour of the suite. The shower was impressive. There was a rainmaker at the top, and a detachable shower head on the left. There were four body jets on the right. When you turned all of them on, you splashed in luxury. 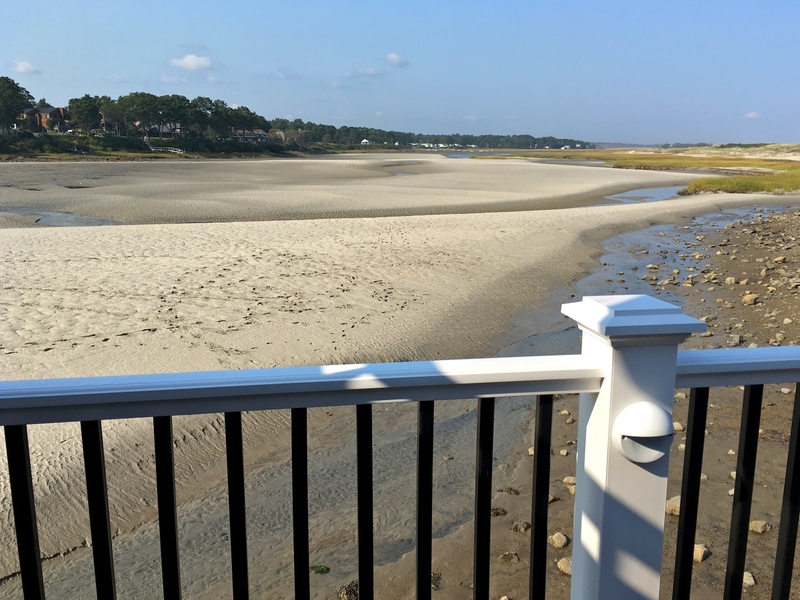 The private deck overlooked the Ogunquit River. 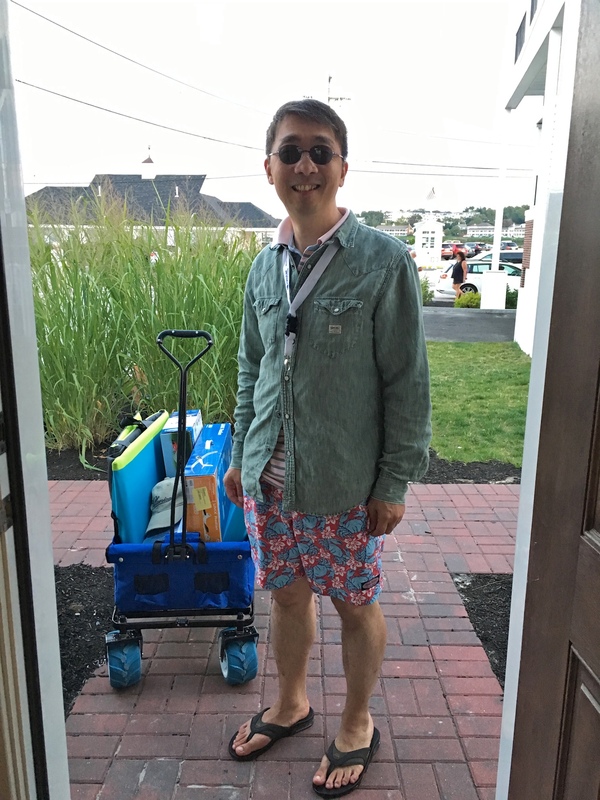 That strange umbrella in the picture did not come with the deck. See modern beach equipment for the model aeronautically-inclined for details. 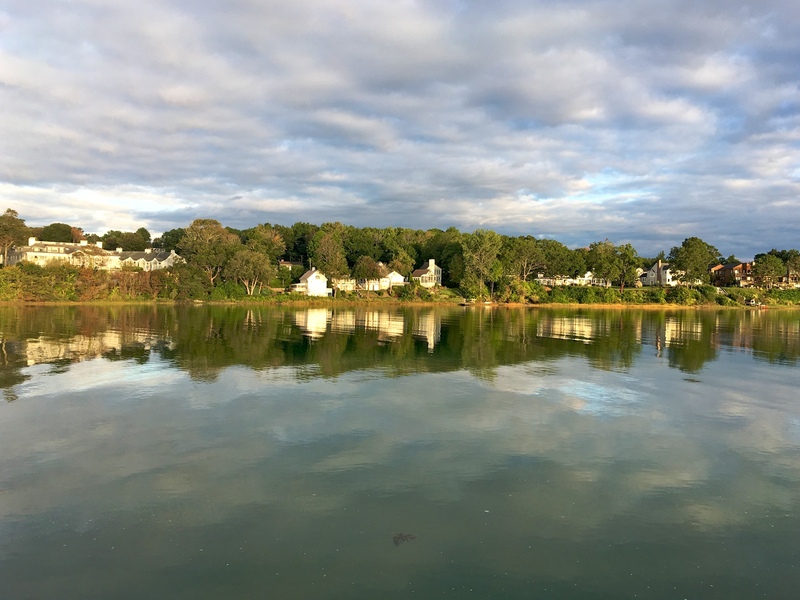 As mentioned, Ogunquit is a tidal river. 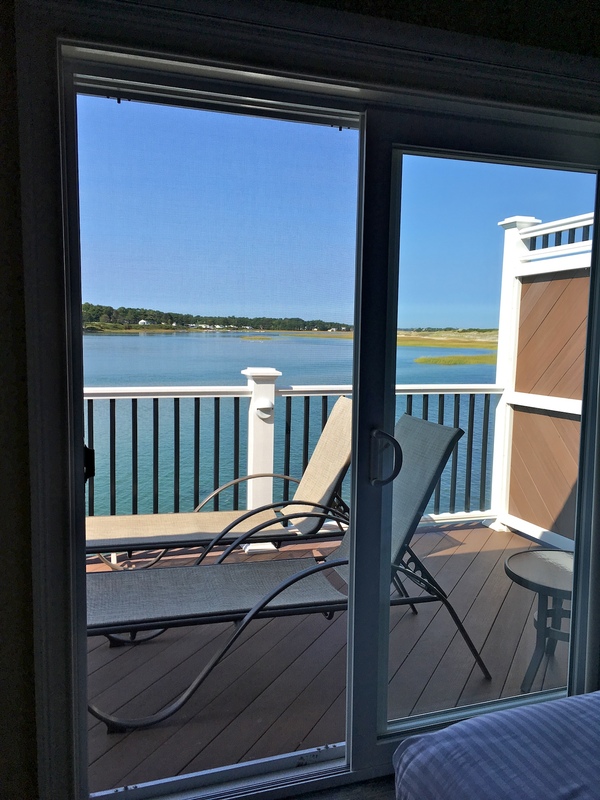 The view from the deck at high tide looks nothing like the previous picture. Convince yourself that this is indeed the same place, by matching houses in both pictures. I was going to rent kayaks for the whole week, and cruise up and down the river. I planned to trace the river North into Wells National Estuarine Research Reserve. But I didn’t want to drive our kayaks on top of our car all the way to Ogunquit. And I left the roof racks home as we never drove long distance with them on top of the car, making funny whistling sounds for the entire trip. Little did I know that no kayak rental stores in this town had direct access to water. Every store told me to just sit kayaks upside down on the thin sheet of metal, colloquially known as the roof of my car, and tie them up with bungee cords. The only guy renting kayaks by the river wouldn’t let me keep the kayak for the whole week. And he only worked 3 hours a day, during peak tide. There went my cunning plan to park kayaks on the deck overnight. I was going to cruise the river, and perhaps even venture out to the ocean. As the tide went out, I would drive the kayak onshore, and haul them through my suite, out to the deck. Perhaps next time. This was a serious question. It plagued me for weeks as I counted days down to my departure. I found no answers online. If you are like me, I have good news for you. No rotten eggs smell. 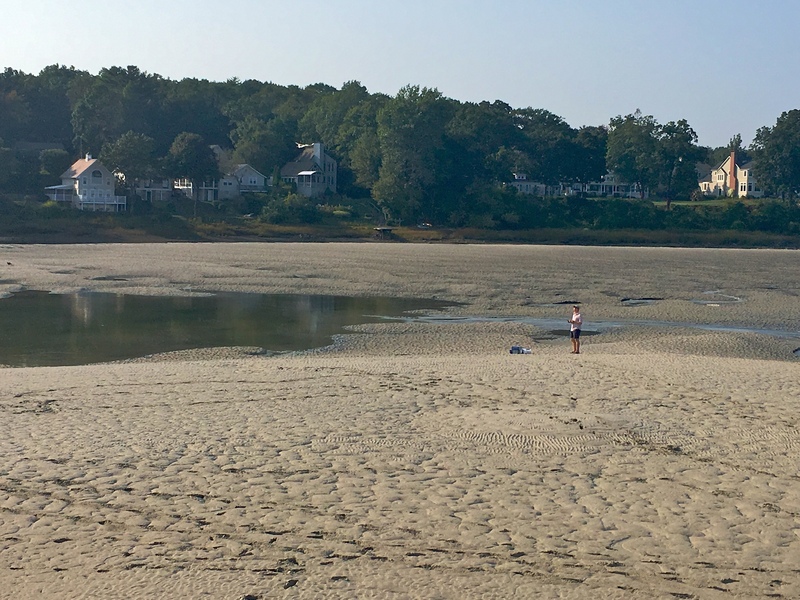 There is only sand on the river bed at low tide. 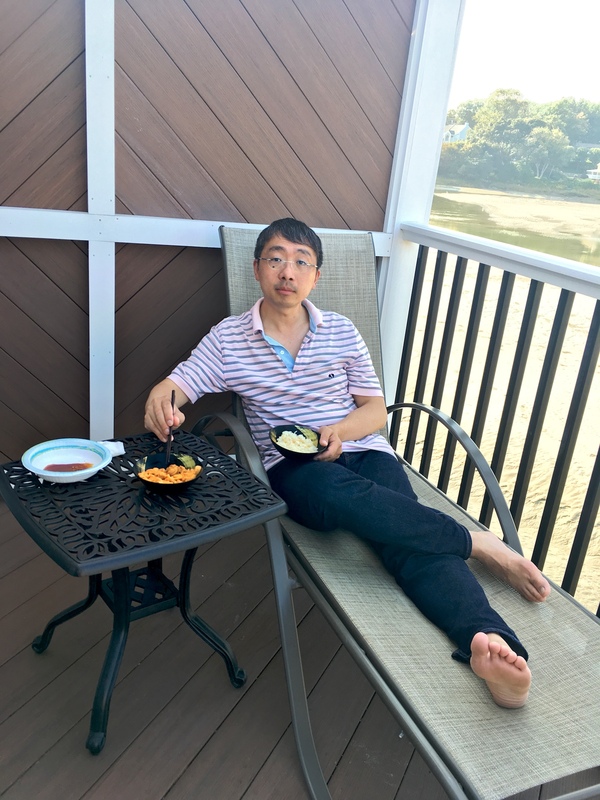 And you can enjoy a nice meal on the deck even when the mighty river dwindles to nothingness, without having to worry about stinky smell. Here are two 360° panoramas from the deck. 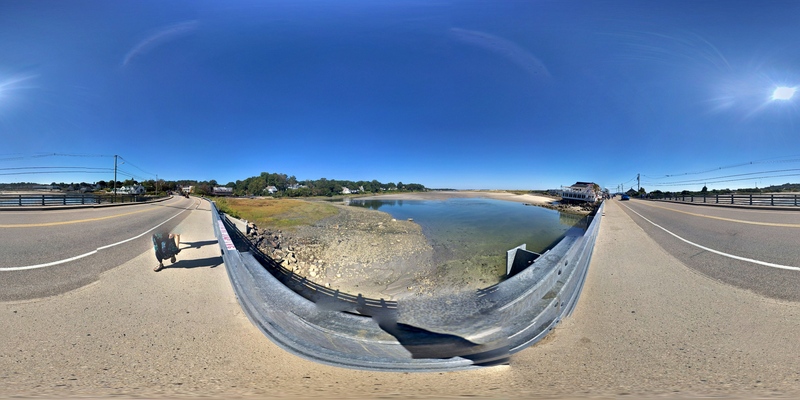 Again, click here for interactive views: low tide and high tide. Obviously no one comes to stay at the suite, and hang out on the deck all day long. Recall that my main activity was flying model airplanes at the beach. But one comes back to the suite to recharge both body and batteries. So I sat at the deck quite often. The first thing I found amusing was that people couldn’t resist the exposed river bed. Everyone walking past the emptied river felt the need to climb down. People tip-toed through the trickle, and tried to walk on the exposed river bed. The thing is, what looks like sand isn’t exactly sand. It’s more like a mixture of sand and clay. Unlike the real beach on the other side of the peninsula, this newly-exposed sand/clay mixture is not compact – you sink a bit as you walk on it. It’s a strange feeling. I do recommend that you try it at least once. Some crazy folks even fly model airplanes standing in the middle of the river. Can you spot the sailplane in this picture? The river bed was, however, not the ideal place to fly sailplanes. The prevailing wind during my stay was from the south mostly. Sometimes it flew from the southwest. Coincidentally, that’s also how the sun tracked from the morning to evening. So I was looking at the sun all the time as I flew the plane upwind. 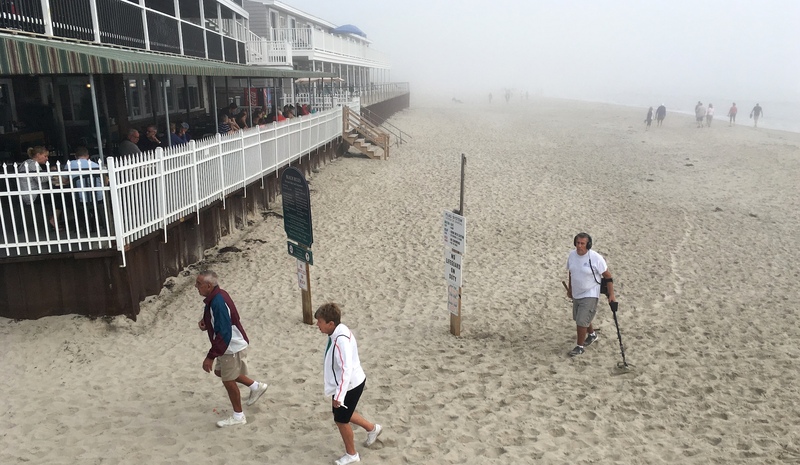 Making matters worse, the wind broke into thousand eddies as it passed between and over odd-shaped buildings such as the restaurant and other resort buildings. Flying my sailplane from the beach with the wind blowing over uniformly-shaped sand dunes yielded more pleasant experiences. I mentioned that the river bed did not smell. 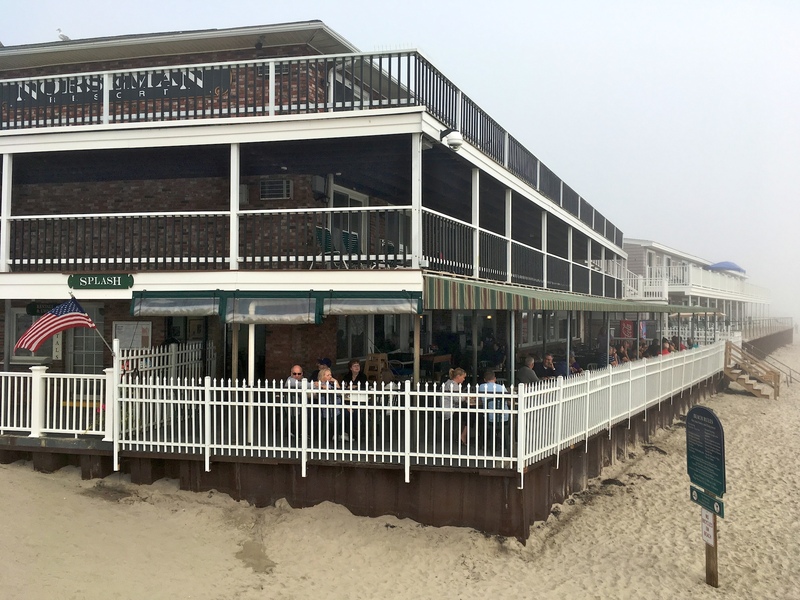 You can have a great meal at the deck. We drove to Portland (Maine) to buy uni (sea urchin) from a processing facility. My wife cooked rice with a rice cooker we brought. Here I was, enjoying my uni don. If you feel disgusted looking at that orange stuff, just think super-soft, presidentially-colored mozzarella. Later in the afternoon I had more orange stuff of another kind. The tide was coming in now. Here is a glorious sunset at high tide. You can be excused for thinking that I lingered all day long on the deck. There are two restaurants on the peninsula. Only one offers a view of the beach and the ocean, Splash. It’s part of the Norseman. We resisted having food here, on the account that no tourist-centric restaurants can be possibly good. But on the last day of our stay we felt no urge to drive to the town, nor walk over the bridge, in the early hours of the morning. So we had our breakfast at Splash. Surprisingly, both service and food were good. 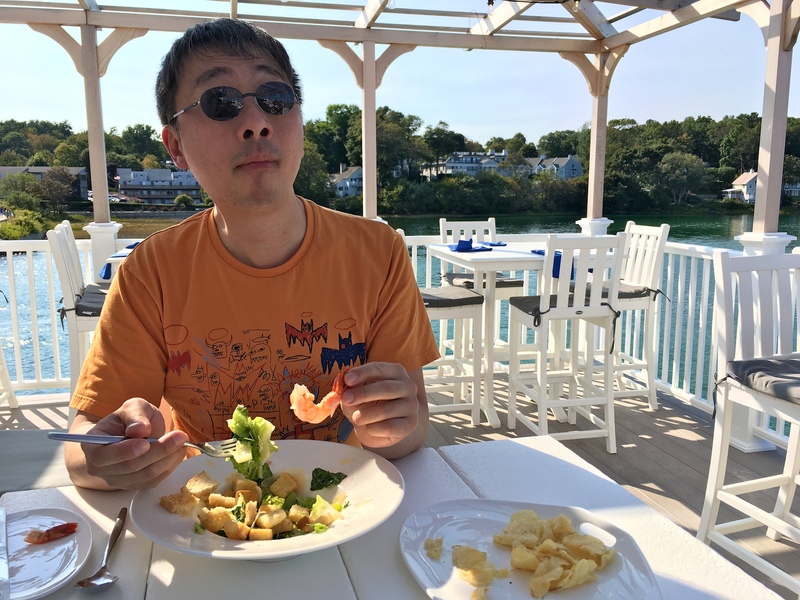 It certainly surpassed my expectations of a beachfront restaurant. Professional prospectors regularly scan popular tourist paths. “Finders, keepers”, they say. I guess there are enough to be made for prospectors to continue to practice their trade on this beach. 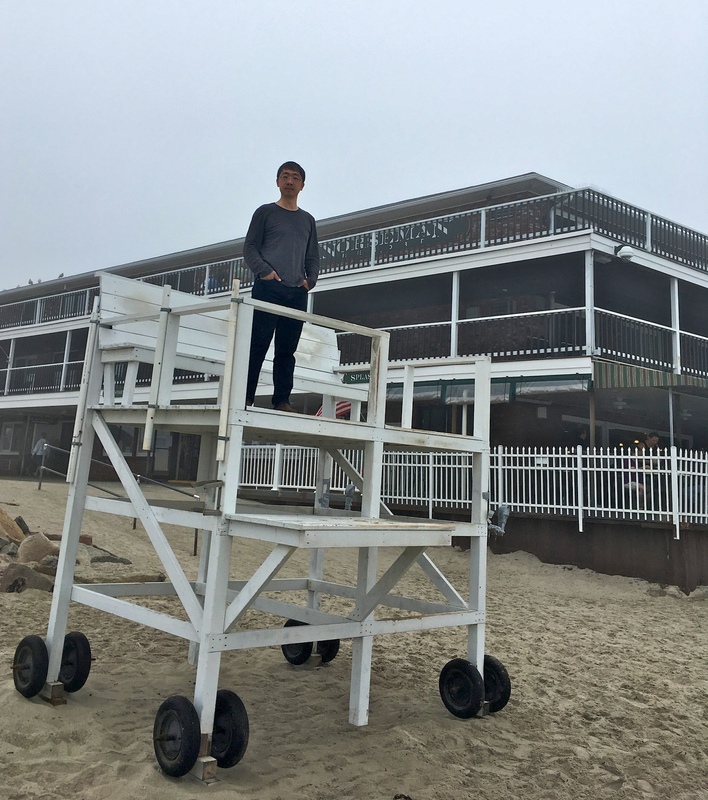 I like lifeguard stations. Usually I can’t resist climbing onto one, when guards are off duty. 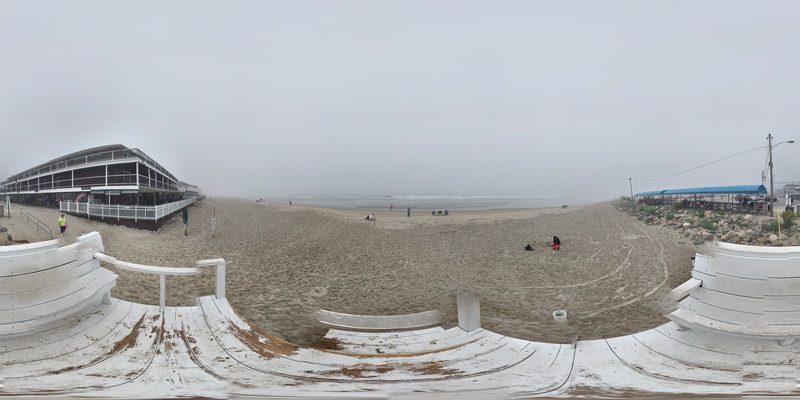 Here is a 360° panorama of the main beach. It’s shot from the top of that lifeguard station. Click here to see the interactive view. Click here for 2D picture. Birds are everywhere. 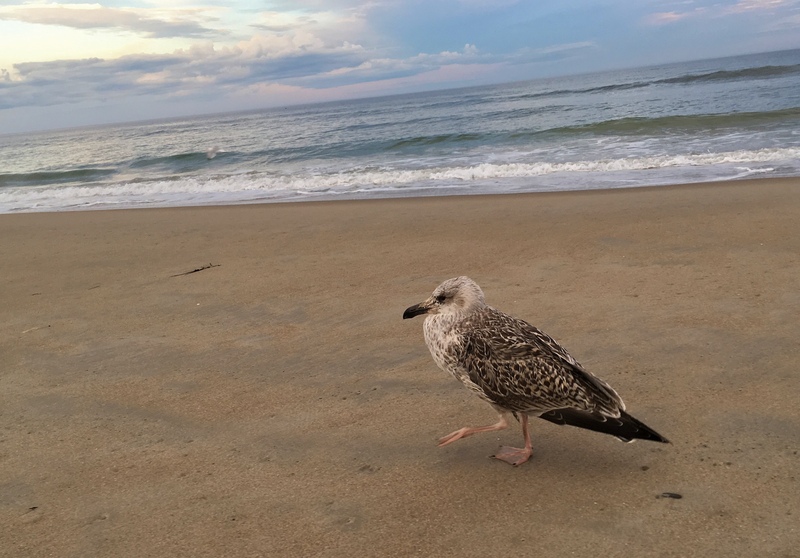 The beach is miles-long, and birds tend to find less traveled sections of the beach to congregate. When startled by visitors they all take off at once. 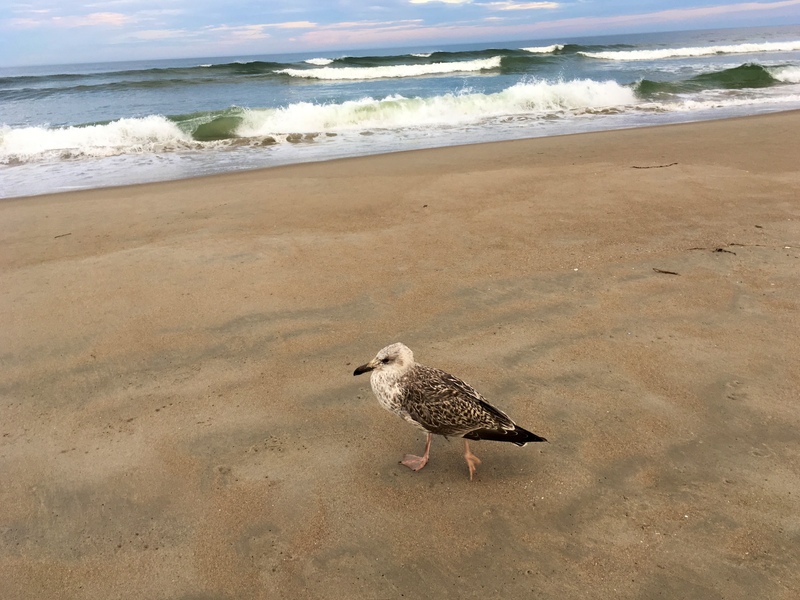 While taking a stroll on the beach, we found a juvenile seagull walking along the shore line. We followed it. We walked alongside it. And it did not care. It just kept walking. I got increasingly closer and closer, and took a lot of pictures. This juvenile gull was visibly larger than all other adult herring gulls and laughing gulls. While other seagulls scattered when approached by people, this large juvenile was not afraid. At one point I walked in a circle around the marching bird taking pictures, and almost stepped on it. But the seagull was utterly nonplussed. That was when I realized it really wasn’t ever going to get scared and fly off. It even started to follow us as we continued to walk. Sometimes it trailed us. Sometimes it led us. In total, it walked with us for 15 minutes along the beach, non-stop. The bird only stopped, at last, when it spotted a family eating pizza. It looked at them long and hard for a minute. It then walked further down for 20 feet, and lounged on a comfortable patch of sand. No amount of cajoling prompted it to walk further. Remember that this is a part of the Ogunquit in September Guide I am writing, for the model aeronautically-inclined. The previous installment can be found at modern beach equipment for the model aeronautically-inclined. More articles will come out, when I get to them. Next two installments will focus on the Cliff House at Bald Head Cliff, and the opportunity to fly model planes standing on perilous rock formations, with multi-person-tall waves pounding on these rocks. The first is Ocean Terrace Rooms at Cliff House. Update 2019-02-27: The Horseman hotel finally has got a nice website with pictures. Here it is: http://ogunquitbeach.com/norseman/. This entry was posted in Being a Wikipedian, Photography, Travel and tagged 360° panoramic photos, Equirectangular panorama, great black-backed gull, High tide, juvenile seagull, Kayaking, Low tide, Marginal Way, Norseman on the Beach, Norseman Resort, Norseman Resorts, Ogunquit beach, Ogunquit River, private deck, private parking space, river bed, river delta, Room, roomscale, seagulls, Tidal river, Tidal Suites. Bookmark the permalink. I will be staying at the Tidal Suites next week for 5 days. Your article and pictures were great to reference. 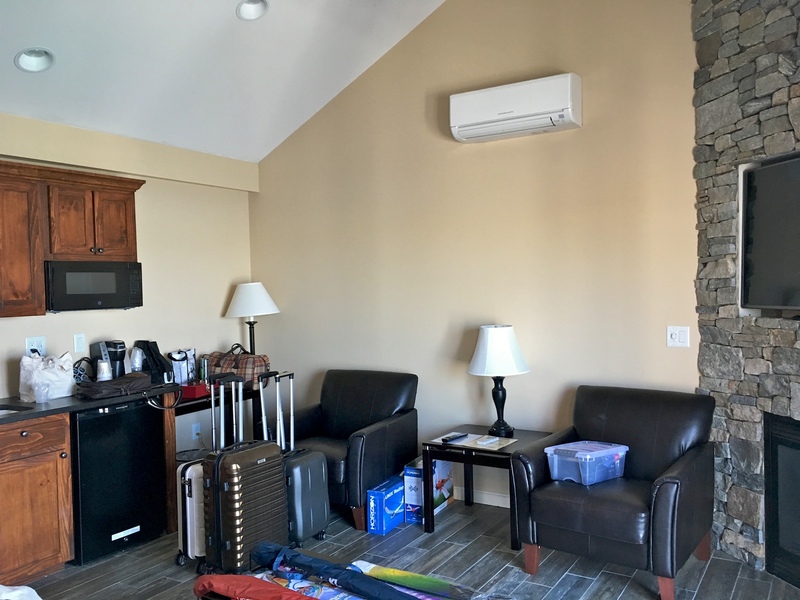 I had been searching on The Norseman website and the pictures did no justice to the suites. Thank You. 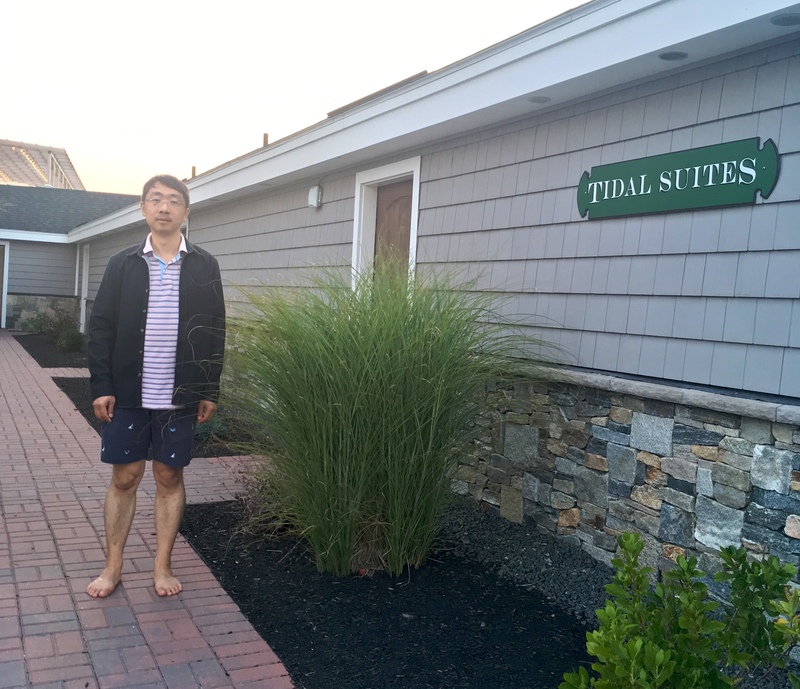 I have stayed at the Beach St rooms that over look the parking lot. Very new and beautiful. I thought I’d try the river side for a change! Thanks again your story and pics were very informative. Thanks for the kind words. Enjoy your stay. This was very helpful. Especially the part about no rotten egg smell at low tide. thank you. Great article!! Thanks :) enjoy you time there if you decide to go. If you do, please drop a comment here after your trip. It would be nice to know how the place is in warm weather.